No Shipping Estimate, Just a Form to Fill Out. What’s Up With That? Like it or not, Veterans Day Weekend is now the unofficial start of the holiday sales season. And, with so many people busy these days, many people who don’t usually shop online are going to take advantage of e-commerce sites to save time and money. And, smart shoppers are likely to use one or more of the many price comparison sites including TheFind.com as well as sites that charge merchants to list their products. When you compare prices, make sure that you factor shipping costs into the mix. To be blunt: many “estimates” are not that accurate and often, customers see low-balled prices that are made up for by inflated shipping and handling fees. This post goes over some of the tricks we’ve seen and why you should do your homework to really get the best deal. Note: when we first wrote this post, Google had free product listings. Now, the “best deal” is not the first one you may see. Instead, merchants bid for placement: the higher the bid, the better it’s placed on Google Shopping. (Please Google Shopping is Becoming a Commercial Site: Impacts to Consumers?) So, it’s worth time to scroll through a couple of pages to compare prices or click on a product and bring up the “view all stores” feature. Shipping has risen quite a bit over the last couple of years, in large part due to fuel costs and fuel surcharges. In addition, some shippers (notably both UPS and just recently FedEx) charge add significantly extra shipping costs for odd-size or large packages. The reason: most items are trucked, and one large item can take the space of several small packages. Fair: we think not, but we don’t make the rules. Because of rising shipping cost, many online retailers continually review shipping options to make sure they offer the best deals to their customers, no matter how they calculate shipping. 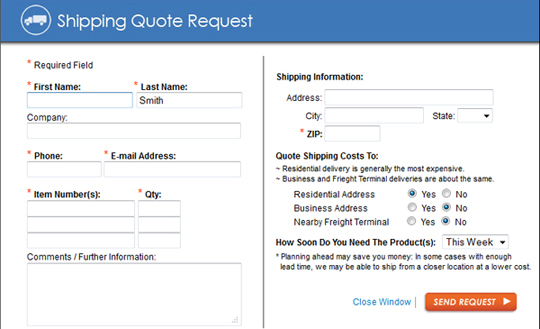 Others aren’t as careful, and can make it difficult for customers to quickly and easily get accurate shipping rates. This post will explain why and give you tips on what to look for to make sure you get the best deal. With competition for online stores being so tough these days, some retailers tend to “gild the lily” so that their products appear to have the lowest total cost on price comparison sites. While it’s true that many, but certainly not all big name and “big box” stores, can offer reduced shipping costs due to the sheer quantity of items they ship, others (we won’t name names) offer the same shipping rates as small retailers. And buying from a Big Box or Big Name store does not mean better price. Many online retailers can more quickly add new products or change their inventory than most large national stores are able to due to layers of management, contracts etc. 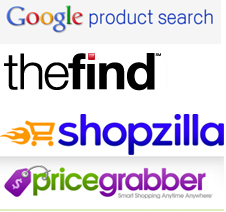 Free shopping comparison sites, such as TheFind.com do not charge merchants to list their products. Some listings, such as those on Bing are a combination of freed and paid listings and others, like the new and “improved” Google Shopping, PriceGrabber.com or Shopzilla.com charge merchants a fee every time someone clicks on an item in their listings. Many retailers don’t use “pay-per-click” sites sites because “window shoppers” can quickly ring up large bills with no intention of making a purchase. In general, consumers get a wider selection of products when a free site is used. Keep in mind that you will usually not know if a site charges its merchants or not unless you click on a link that is something like “For Merchants,” “Merchant Log In” etc. Consumers should compare shipping prices carefully, because “estimated shipping costs” highly inaccurate. Consumers should also look for certain things on an online storefront to make sure it offers secure check-out and does business legitimately. The lowest price is not always the best deal if you buy from a fly-by-night or dishonest merchant. For more information, please see our article: Tips for Safer Online Shopping for a primer on what all smart online shoppers should know, which points out that along with price, you should shop on secure sites that offer credentials about protection they offer customers. And, the quality of a site is important. You want a site that is updated regularly, looks professional and appears to have time and money involved in its its design and maintenance. Why? Because if you need to return the item or take advantage of a manufacturer’s warranty, you want to make sure that the online merchant will still be there in one, three or twelve months. Compare Apples to Apples, not Apples to Basketballs! Many online stores advertise free shipping. And just as there are no free lunches, there really isn’t free shipping. Free shipping means that the merchant builds average shipping costs into their overhead and into its product prices. Free shipping is used for three primary reasons. First, it is easier for the merchant because as each order does not time-consuming calculation of shipping costs for each sale for the merchant or the customer. This time can instead be spent on marketing or customer service. Second, it’s easier for the consumer to compare prices with free shipping as there are no surprises when you check out, or when you get an additional charge long after you make place your order. Read on and find out why. Finally, free shipping and “flat shipping fees” are far more accurate more convenient when comparing prices. If an online retailer does not offer free shipping or a flat shipping fee, then the actual shipping cost will be tallied and added to your credit card (or PayPal) account hours or even a day or weekend AFTER you place your order. Look Familiar? ONLY AN ESTIMATE! It is important to know that the true and final shipping costs can only be determined after a shipper has entered the package into its system. Period. And, the guy four blocks away in a single-family home may be charged less than someone that lives in a condo or an apartment building because multi-family units represent “more work” for the delivery person. Unless a merchant specifically states that the shipping cost is as stated in checkout, you are likely to get hit with additional charges later. The time between when you place your online order and when you get the final tally (including shipping) depends on when the retailer processes the order and when it is picked up and processed by the shipping company. Some retailers process all orders at the end of the day. The items themselves may be shipped that day or the following day. So if it is a Friday or a weekend, the true shipping cost may not be available until late in the day on Monday. Creating an account with the store can take several minutes and sometimes requires you to enter your payment data whether you ultimately make the purchase or not. While this may be annoying, it is an key fraud protection measure recommended by payment processors and insurance companies. It lets the merchant spot red flags of fraud, such as a billing address in Illinois and a shipping address in Texas, among other tip-offs that the legitimate holder is not using the card. Unfortunately, stolen credit cards or credit card numbers often are processed successfully until the card holder becomes aware of the theft and reports it. And far too often, this is not the either when they go to use the card and find it missing, or worse, when they read their billing statement. By reducing fraud risks, a merchant can offer lower prices and better service to customers. And, responsible merchants alert cardholders when they a credit card is denied for reasons such as an invalid security code or improper expiration date. The merchant doesn’t see this information, but credit card processors tell merchants why the transaction was denied if the proper safeguards are in put in place by the merchant. Let’s say that are looking for a Solar Lamp and do a Google search to compare prices. You’ll get something that looks like the picture below. 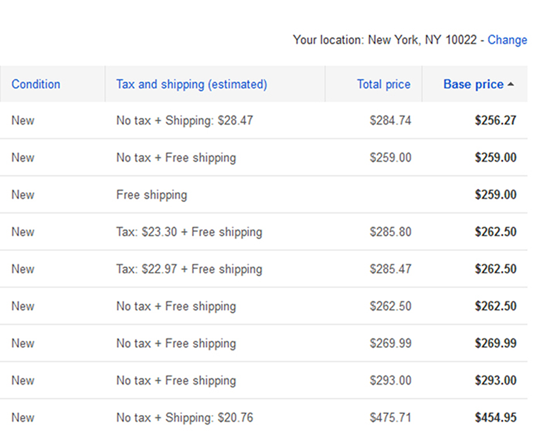 As you can see the prices range from $256.27 to $443.95, and prices are listed with free shipping or “estimated shipping. The lowest price is $256.67 plus an estimated shipping cost of $28.47. We tested that shipping cost using three different but real addresses, one in New York City, one in Florida and one in California and got the same estimate price for all three. As distance is a factor in shipping costs, we found this surprising. The total of the solar lamp actually came to at least $285.74 for all three addresses, more than many others on the list. And, as with all products with “estimated shipping,” we received a notice like we would be notified of the final price once the product had been shipped. And if you don’t like the final price, good luck: many sites treat cancellations as returns and can charge up to 20% to cancel the order. Do You Want to Submit Your Payment Info BEFORE You Know the Total Cost? One thing that all merchants know is that time is an important factor and one reason people shop online in the first place. Often, even if the actual shipping cost is higher than the estimate, many people will continue with the order thinking that all shipping costs are more or less equal, which is just not true! And, more than a few merchants rely on your time invested to take advantage of you: they know often you will continue the purchase because you often have time invested and often have already provided them your payment information before you get the actual shipping cost. No Shipping Estimate, Just a Form to Fill Out. What’s Up With That? Buy now, find out shipping cost in 2 or 3 days? No thanks! We closed out of that check-out cart immediately and went on to tests other products. The results were pretty much the same. When “estimated shipping costs” or “flat shipping costs” were factored in, prices generally was equal to or more than products listed as having free shipping. The sites that showed no shipping information had estimated shipping costs that ranged from $9.50 to $20.34. And remember, unless stated otherwise, the shipping is estimated until the product is actually shipped. At first glance, it seems that the best deal is available through Store A. If Store B estimates shipping at $15.00, one can rationally assume that Store A’s shipping cost is pretty much the same. And forget about Store C, why are they charging more and saying “free shipping?” Right now, it really doesn’t seem to be such a good deal compared to the others. We visited store A’s website and selected the solar light priced at $49.99 plus shipping. At check-out, the shipping was calculated at $26.00, for a total cost of $75.99. Surprising, but this is often the case. Next, we went to Store B’s website and ordered the solar light for $52.99 expecting the “estimated shipping cost” to be about $15.00. But, when at check-out, the actual estimated shipping cost was $25: a total cost of $77.99. This is not uncommon: the store’s comparison listing accurately stated that it was an “estimated shipping” cost. Most sellers do not intend to mislead potential customers, but some take every advantage they can and tend to play fast and loose with estimated shipping costs. Store B may not have updated their shipping costs recently, could have been unaware of recent fuel or package size surcharges, or estimated that their customer base lived closer to the shipping origin point than the addresses we entered. Finally, we went to Store C’s website and selected the solar light for $68.99 with “free shipping.” At check-out, the final cost was $68.99, with no potential extra charges later on. So, what originally looked like the most costly product is really the least expensive. One of our pet peeves are those stores that advertise “free shipping.” But when once on their site, you quickly see that it’s only free if your purchase exceeds a certain dollar threshold. Many comparison sites are clamping down on this, so you see it far less than in the past, but sometimes merchants can figure out ways to get this in. We next did a test search of a solar light that listings showed ranged in the $49.99 to $59.99 range. One was listed for $49.99 on the site comparison page with “free shipping.” But, when we went to the site, free shipping only applied if the total order was $100.00 or more. Another of our pet peeves are stores that say “Free Shipping Today Only!” As a retailer, we check our competitors’ sites and prices regularly. More than a few use this practice: the same products are shown as having “Free Shipping Today Only” every time we visit. Is this wrong? Depends on how you look at it. On hand, free shipping is free shipping! On the other hand, it is meant to encourage quick purchasing decisions. Our main issue with this gimmick: what other tricks do they use and what else are they being less than honest about? Remember: if they aren’t honest BEFORE the purchase, good luck if there is a problem afterwards. Bottom Line: take all shipping estimates with a grain of salt. If you really want to compare apples to apples, look for flat rate or free shipping. Ultimately, it’s up to the consumer to do the extra work and to get the best prices. You need to balance the time it takes to do your homework with what saving you’ll see, because often shipping is a good percentage of the final purchase price. Copyright 2013, www.SolarFlairlighting.com, www.SolarLightingSmart.com, AM McElroy. This post, or sections of it may not be used in any form what-so-ever without the express written consent of one of the above parties. This entry was posted in Online Shopping Tips by SolarLightingSmart. Bookmark the permalink.